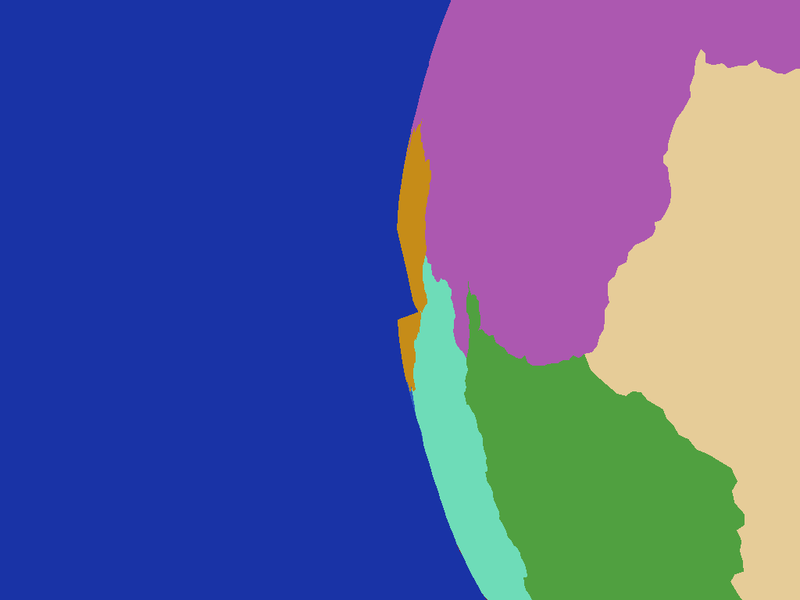 After spending some time on a system to make names for places as described in my last project post I thought it would be interesting to look at creating countries for my planet I could then attach such names to. I wanted to create a system where I could determine from any point on the surface of the planet which country it was part of. 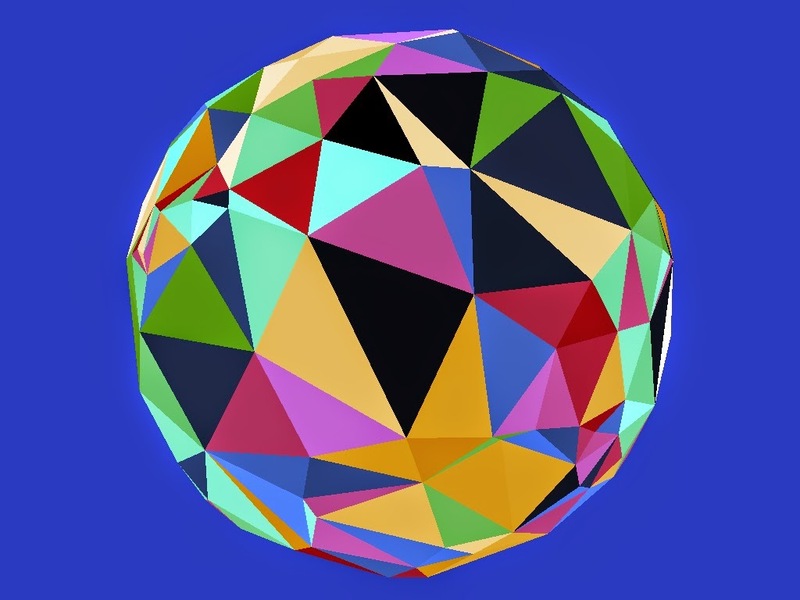 I thought the easiest way to go about this would be to create a triangulated shell around the planet against which a ray from and normal to the surface could be intersected, the triangle that was hit would let me know which country the point was within. 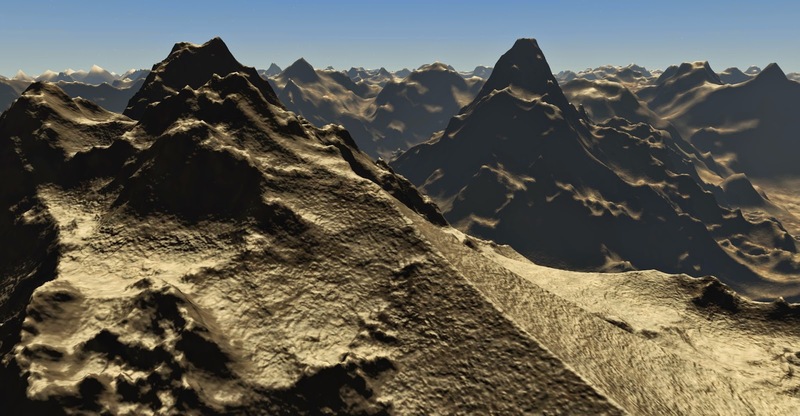 Note the jagged edges of the triangles here (shown in close up in the top corner) in contrast to the smooth ones in the direct rendering of the control net above - remember this second image shows the individual terrain triangles flat shaded, effectively point sampling the country control net. This is not something you generally see in the real world and was what I felt to be an unacceptable results which unfortunately I couldn't think of a way to correct. I ruled out noise perturbation as a result and went back to the drawing board. 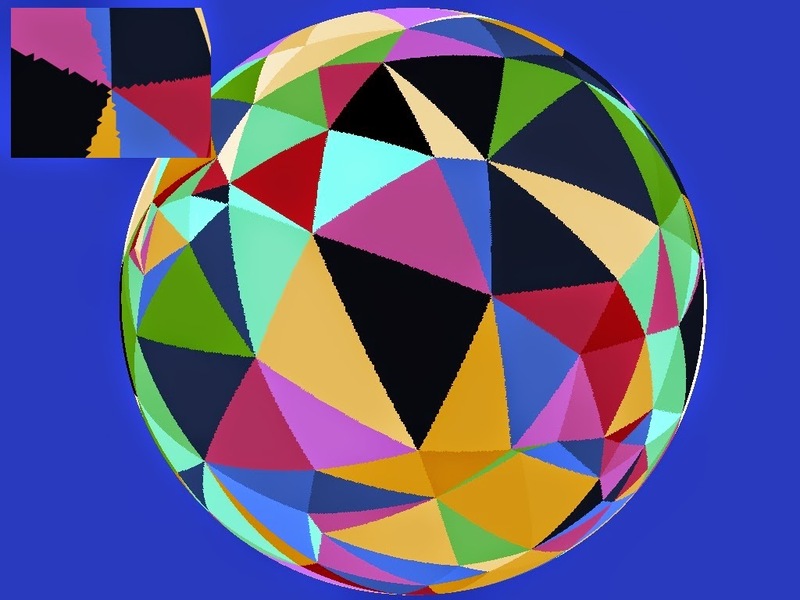 Instead of noise then I had to come up with plan B - my second approach was to subdivide the edges of the triangles adding displacements to the introduced points to make the edges more interesting. In this way the boundaries can be more interesting while still preventing "bubble" errors. The process here is to recursively divide any boundary edge over some minimum length introducing a new boundary point in the middle of it. 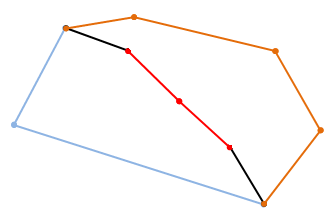 The cross product of the edge vector and the normal gives a tangent which is used to displace this new point by some random amount. The magnitude of this displacement is capped to be a proportion of the length of the edge so long edges have their midpoint displaced further than short edges to keep things in proportion. 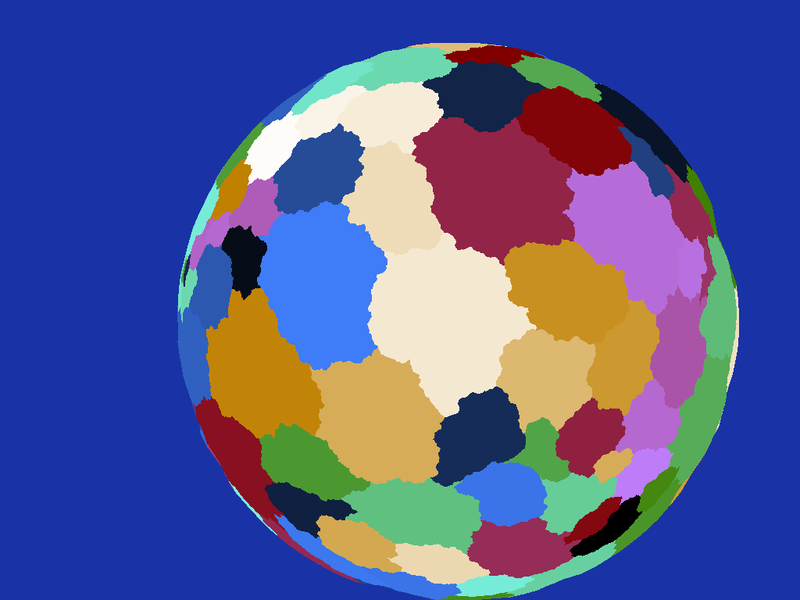 Subdividing the edges did turn my nice triangles into n-gons so I also had to add in a triangulation step to turn each set of country boundary points back into a mesh I could both ray test against and render for debugging purposes. As I knew the boundaries couldn't have holes I used the trusty Ear Clipping Algorithm as it's so simple to implement and fast enough for this case. 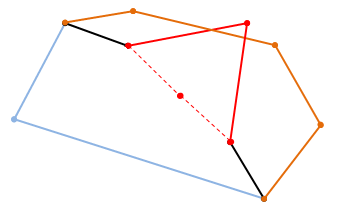 So for each potentially displaced midpoint the two edges that would connect it to the original edge's end points are tested for intersecting any of the remaining edges of the two boundaries that adjoin across the edge being split. 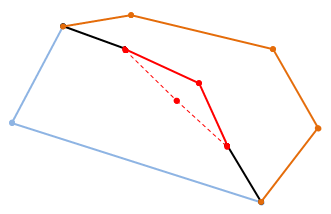 If no intersection is found the displaced point is valid and I move on testing the two created edges to see if they in turn can be sub-divided, if however either of the two new edges intersect a remaining edge I have to pick a new position for the midpoint and try again. To reduce the chance of getting stuck trying to find a valid position each time I have to reposition it I reduce the maximum magnitude of the displacement with each attempt so the new midpoint gradually tends back to the original edge. If the magnitude gets so low it's not worth dividing the edge at all I just give up, leave the original edge undivided and move on to the next edge. This only tends to happen in highly acute boundary corners where slivers are produced. I experimented with increasing the number of seed points which meant more smaller triangles to start with but although the effect was improved a bit more it felt more like treating the symptom than a cure. Note how the irritating nexus points no longer feature, the countries join in what I feel to be a far more realistic manner. 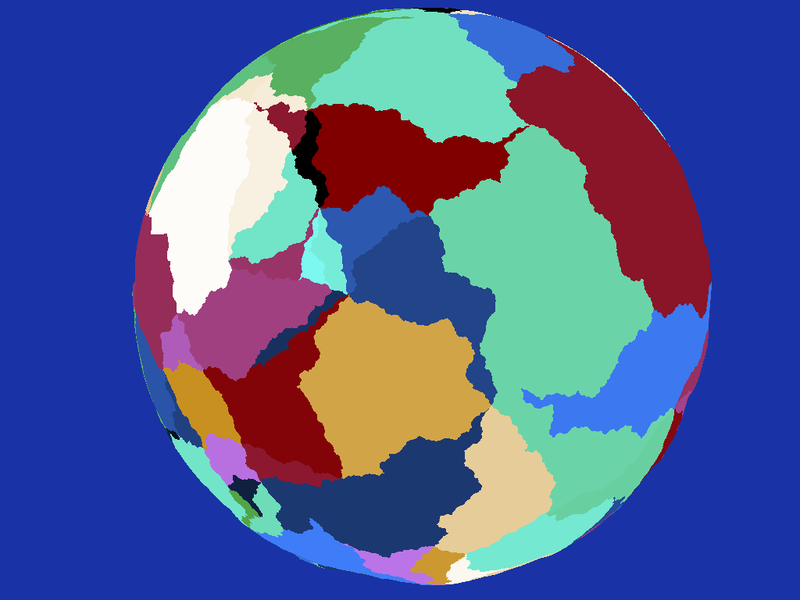 The main issue I have with it now though is the countries before merging are a bit too similar in size causing the result to be a bit uniform - I think in the future I'll play around with clustering the seed points somehow instead of having them uniformly random and see how that affects things. 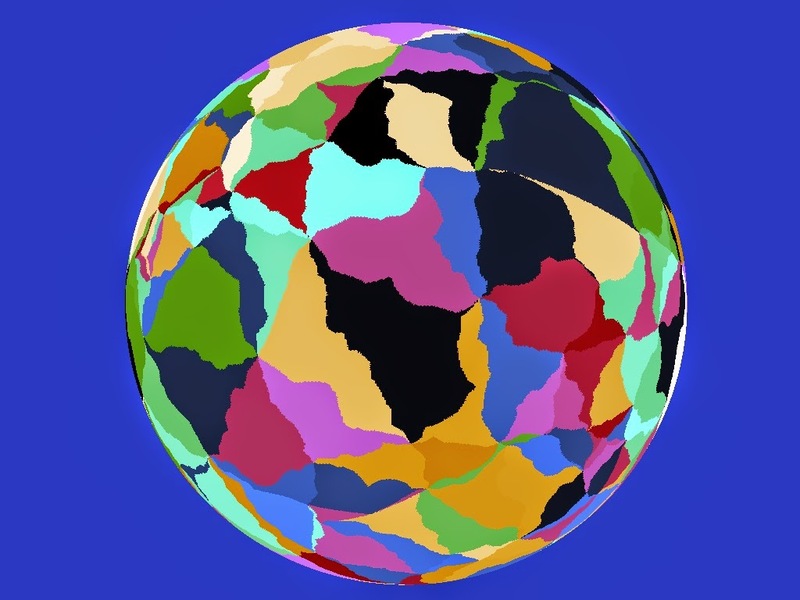 this isn't a problem however as remember I'm not normally rendering the country boundary geometry directly, I'm just intersecting rays shot from the far denser planet surface mesh against it to determine which country a point is located within. 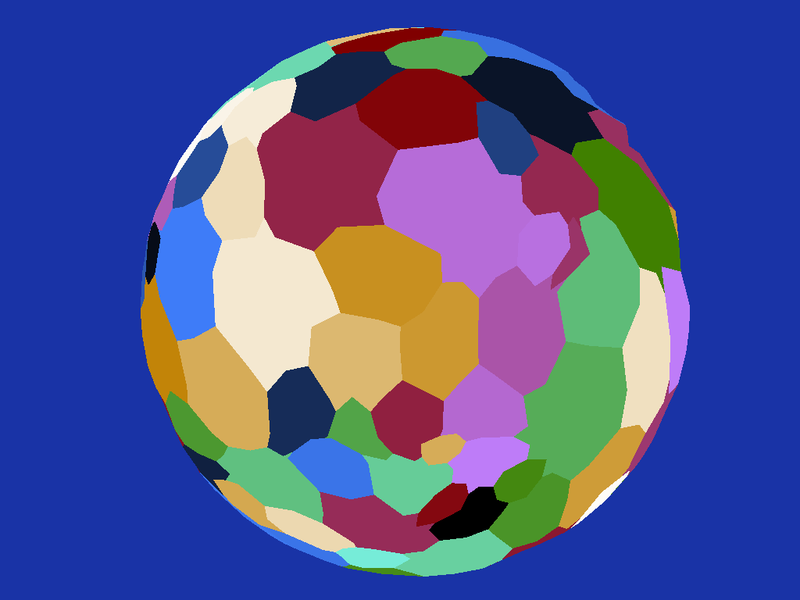 While working on this there were a number of times when I had to intersect rays or 3D line segments with triangles. I was using a trusty old intersection routine I've had kicking around for years but found that even with double precision there were times when a ray or line would be reported as missing a triangle that it really should have intersected, usually when falling on an edge between two adjoining triangles. Puzzled by this I did a little research (i.e. consulted Google) and found a better intersection algorithm specifically designed for intersecting with meshes, "Watertight Ray/Triangle Intersection"
Implementing this solved all my problem cases in one fell swoop so it turned out to be a good find, if you are interested in using it do note however that there appears to be a minor error in the code presented in the paper, see near the bottom of this blog post for more info. Although this has been focussed on country generation, while working on it I have thought that the system could also be used to produce areas of water for oceans and seas by simply flagging certain boundaries as water zones. This would produce some nicely shaped features while avoiding the problem of parts of a country being underwater if water was placed by a different system. 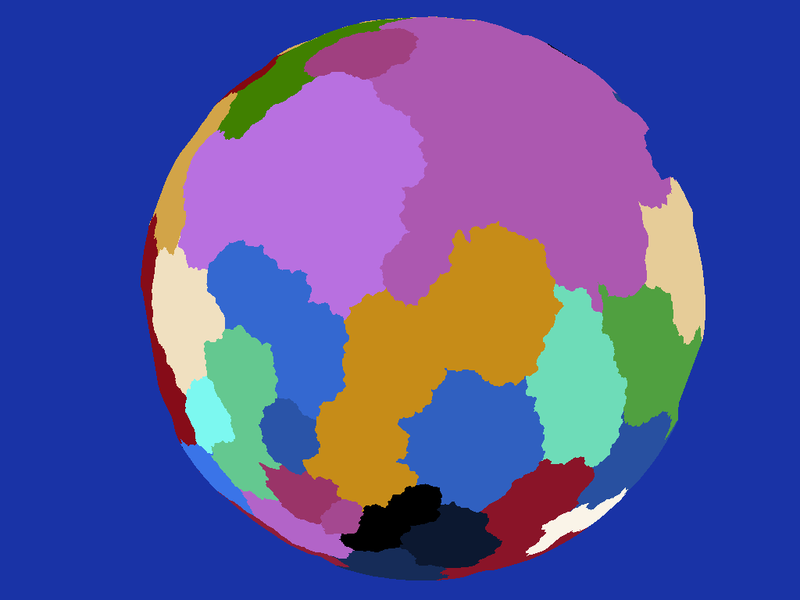 I will need to feed the country boundaries into the elevation production system however for this to work so the water zones and coastlines are given appropriate topology. Something for the future anyway. So there you have it, a set of what I feel are quite realistically shaped countries I can use to move on to the next step, possibly placement of towns and cities followed by primary road or rail networks...that sounds like it should be interesting to look into anyway. Enclaves and Exclaves are a thing. 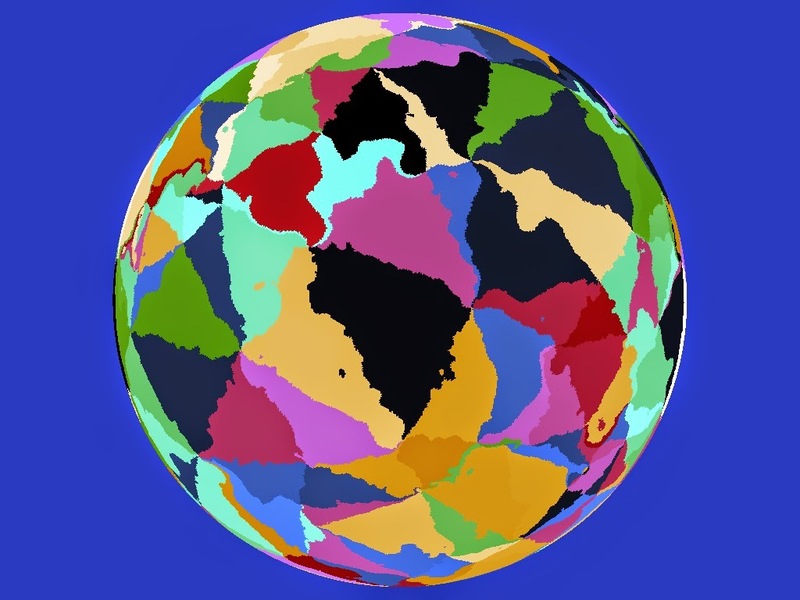 "Bubbles" of the territory of one country being entirely surrounded by another country are not unrealistic, and in some cases can be very extreme. Thanks for pointing this out, it's not something I had really thought of - after a little Wikipedia though (http://en.wikipedia.org/wiki/List_of_enclaves_and_exclaves) I agree it's definitely worth considering. There are some advantages to having the country boundaries encoded as geometry as I feel they will be useful when placing boundary related entities such as border points or fences which would be hard to locate using noise perturbation but I think it would make things interesting to try to incorporate this real world feature into the control net somehow. 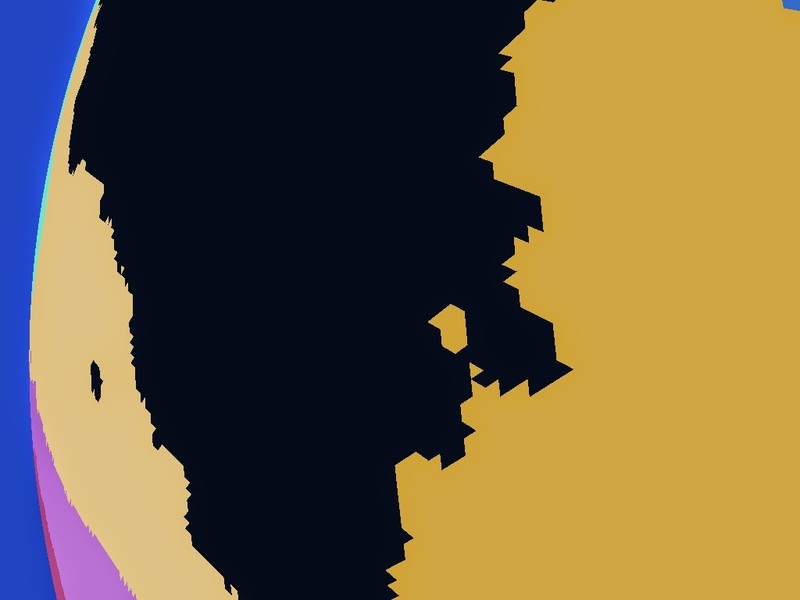 Perhaps the merging routine could be adapted so boundaries that are close but not conterminous could be merged to produce exclaves...the odd enclave might appear by chance too. Something to think about anyway!